For some reason, Polaroid decided to switch their crappy plastic rangefinders with a good ol’ Zeiss on a few of their packfilm models. The first was the Automatic 250. But it, like many of its type, has a pretty crappy lens and no manual controls. 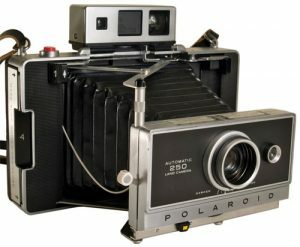 However, Polaroid did make the overpriced 180/5 and 190/5 with manual controls, but usually not always with the Zeiss finder. Odd. The main difference between the 180/195 and other packfilm models is their glass element lenses and manual shutter. All other packfilms, the 250 included, are fully auto-exposure. In my photography, automation is never a good thing. If you try to pick up a 180/195, be prepared to spend alot more than even an unconverted 110B. An alternative is to make an Automatic 250 into a fully manual camera with a nice glass element lens. Polaroid also released the 350, 360 and 450 with this Zeiss finder. These models are slightly different, mostly because they have a built in flash bracket, and will be dealt with in another conversion. After I completed my 150 and 110A conversions I wanted to try something new. This project seemed like a good chance to try the exact opposite of a 110A packfilm conversion.